We still wonder how on earth did Gaddafi manage to stay in power for forty years? Did no one notice his madness until now? Did no one notice that he built a HUGE FRESH WATER PIPELINE to the Benghazi region, that lunatic? Were they waiting for him to finish? The 1st of September marks the anniversary of the opening of the major stage of Libya’s Great Man-Made River Project. This incredibly huge and successful water scheme is virtually unknown in the West, yet it rivals and even surpasses all our greatest development projects. The leader of the so-called advanced countries, the United States of America cannot bring itself to acknowledge Libya’s Great Man-Made River. The West refuses to recognize that a small country, with a population no more than four million, can construct anything so large without borrowing a single cent from the international banks. …In Libya there are four major underground basins, these being the Kufra basin, the Sirt basin, the Morzuk basin and the Hamada basin, the first three of which contain combined reserves of 35,000 cubic kilometres of water. 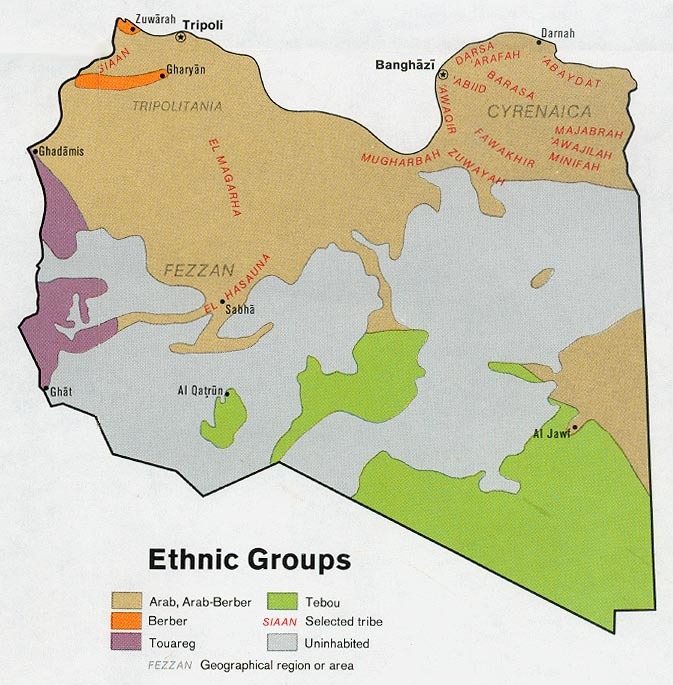 These vast reserves offer almost unlimited amounts of water for the Libyan people. The people of Libya under the guidance of their leader, Colonel Muammar Al Qadhafi, initiated a series of scientific studies on the possibility of accessing this vast ocean of fresh water. 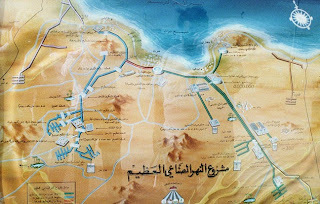 Early consideration was given to developing new agricultural projects close to the sources of the water, in the desert. However, it was realized that on the scale required to provide products for self sufficiency, a very large infrastructure organization would be required. In addition to this, a major redistribution of the population from the coastal belt would be necessary. The alternative was to ‘bring the water to the people’. The Great Man-Made River, as the largest water transport project ever undertaken, has been described as the “eighth wonder of the world”. It carries more than five million cubic metres of water per day across the desert to coastal areas, vastly increasing the amount of arable land. The total cost of the huge project is expected to exceed $25 billion (US). The goal of the Libyan Arab people, embodied in the Great Man-Made River project, is to make Libya a source of agricultural abundance, capable of producing adequate food and water to supply its own needs and to share with neighboring countries. In short, the River is literally Libya’s ‘meal ticket’ to self-sufficiency. Self-sufficiency?!? Absolutely Not Allowed. Banksters don’t like that sort of thing one bit. This project has been in the works for many years. Have you ever heard of it? We had not until today. A gala ceremony was held in Libya at the end of August, at which Libyan leaders “turned on the tap” of the Great Man-Made River, the water pipeline/viaduct project designed to bring millions of liters of water from beneath the Sahara Desert, northward to the Benghazi region on the Mediterranean coast. The inauguration marked the end of Phase I of the project, which is slated for completion in 1996. Under the giant scheme, water is pumped from aquifers under the Sahara in the southern part of the country, where underground water resources extend into Egypt and Sudan. Then the water is transported by reinforced concrete pipeline to northern destinations. Construction on the first phase started in 1984, and cost about $5 billion. The completed project may total $25 billion. South Korean construction experts built the huge pipes in Libya by some of the most modern techniques. The engineering feat involves collecting water from 270 wells in east central Libya, and transporting it through about 2,000 kilometers of pipeline to Benghazi and Sirte. The new “river” brings 2 million cubic meters of water a day. At completion, the system will involve 4,000 kilometers of pipepines, and two aqueducts of some 1,000 kilometers. Joining in celebrating the inauguration of the artificial river were dozens of Arab and African heads of state and hundreds of other foreign diplomats and delegations. Among them were Egyptian President Hosni Mubarak, King Hassan of Morocco, the head of Sudan, Gen. Omar El Beshir, and Djibouti’s President Hassan Julied. Col. Muammar Qaddafi told the celebrants: “After this achievement, American threats against Libya will double…. The United States will make excuses, [but] the real reason is to stop this achievement, to keep the people of Libya oppressed.” Qaddafi presented the project to the cheering crowd as a gift to the Third World. Mubarak spoke at the ceremony and stressed the regional importance of the project. Qaddafi has called on Egyptian farmers to come and work in Libya, where there are only 4 million inhabitants. Egypt’s population of 55 million is crowded in narrow bands along the Nile River and delta region. 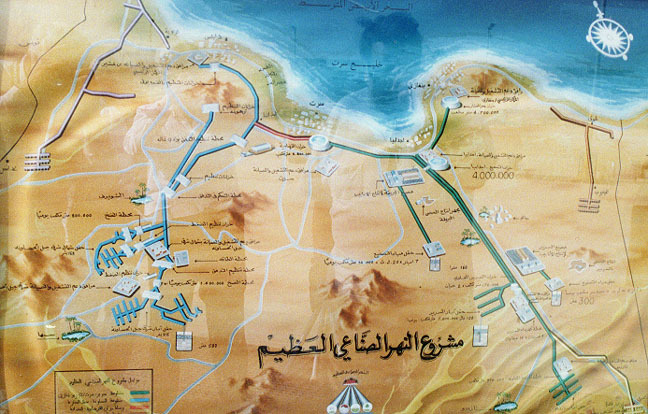 Over the last 20 years, the water improvement projects envisioned for Egypt, which could provide more water and more hectares of agricultural and residential land, have been repeatedly sabotaged by the International Monetary Fund and World Bank, and the Anglo-American financial interests behind them. In the 1970s, Qaddafi expelled many Egyptian families from Libya, but over the recent months the two countries have become close once again. There are plans to build a railway line to facilitate travel back and forth. There is also a standing commission between Sudan and Libya for integrating economic activity. Over 95% of Libya is desert, and the new water sources can open up thousands of hectares of irrigated farmland. At present over 80% of the country’s agriculture production comes from the coastal regions, where local aquifers have been overpumped, and salt water intrusion is taking place. The Great Man-Made River will relieve this. The water now flowing will immediately supplement supplies for domestic and industrial needs in Benghazi and Sirte. But Libyan officials plan for 80% of the overall project’s flow to eventually be used for irrigating old farms, and reclaiming some desert lands. Since 20% of Libya’s imports are foodstuffs, expanded water supplies are a means to greater self-sufficiency. The Great Man-Made River project and its objectives fly in the face of the water-control schemes sanctioned by the World Bank and the International Monetary Fund. These institutions have blocked work on other “great projects” such as the Jonglei Canal–the huge ditch that was designed as a straight channel on the upper White Nile in southern Sudan. The Jonglei Canal, which stands half-finished and abandoned at present, would have drained swamplands, aided agriculture, transportation, power resources, and health, and provided expanded flow to the Nile River all the way down to Egypt. The World Bank and the U.S. State Department are backing a “Middle East Water Summit” in Turkey this November, which is intended to promote only politically favored projects such as desalination plants in Saudi Arabia, and water shortages elsewhere. If it is vanity that motivated the project, at least the vanity of Libya’s head of state is being channeled in a productive direction in this case–which is more than can be said of the leaders of Britain and the United States. Wow! Qahdafi is certainly looking like a prophet regarding how the vultures and thugs (aka D.C., London, and Tel Aviv) will try to cause trouble for Libya. This is more proof that the only terrorism in the world today is not Muslim terror, but Zionist/Satanist terror. Apparently Qahdafi pissed off the bilderbergers. You can be sure that the bilderbergers are also using muslims to do their dirty work. It doesnt surprise me that for years the 4th Reich and its operatives and media have demonized the guy because he doesnt need it and it wants the resourses in the country where he’s been its public servant. he may or may not be a tyrant but the banality of evil that we’ve got at the present time in the US vrs what we had under the Constitution isnt much better. Great article! thank you for putting a link back to us! Could you please quote us as a source? Great that he is into big projects. So were the Pharaohs. Some of them were good men and some were decidedly bad men. Several years ago my daughter wanted to adopt a child orphaned by war. She was scrolling through the stories of individual children. Most were orphaned as a result of Qaddafi’s ruthlessness. We are now seeing how he stayed in power so long. He has contracts out on other Arab leaders to be carried out if things don’t go his way. He owns 5 oil wells. Why wouldn’t he be able to do whatever he wants for a long time? But you cannot bomb your own people in this modern world and expect the world to turn a completely blind eye. The Arab League is who asked for the no-fly zone. No. Begged for it. France fired the first shot. Libya’s people remind her of her own storming the Bastille centuries ago. So it is wonderful the free people of Libya will have water. Who exactly are the Libyan “rebels”?? Who is supplying them with arms and munitions?? Some reports say it is the “Muslim Brotherhood” – which in turn are Shiite “extremists” controlled by MOSSAD in Tel Aviv – who just happen to be the supposed culprits behind Al-Quaida and the attacks of 9-11. HMMMM. Seems the MOSSAD can’t get their stories straight – who are the enemies?? Look, I have never met Qaddafi – yet I have interviewed those who have. He is rabidly anti-Israeli and pro Palestinian. Don’t you think it at least POSSIBLE that propaganda from Tel Aviv (concerning the orphaned children stats) is not accurate? Remember how that monster Saddam Hussein was accused of killing babies in incubators in hospitals — (proven later to be completely false.) Both the attack against Hussein and now Qaddafi began on the Festival of Purim. Just coincidence?? All bad things worldwide come from the bilderberg group who are setting up one world government. Thank you so much for opening my eyes just a little wider. Incredible story! My question is, how deep does this story actually go? American says it doesnt know who the rebels are. Qaddafi claimed the West and even Al Qaeda. Is he allowed the benefit of the doubt? Why on earth would America take sides if it doesn’t fully know who the rebels are? If he did kill his OWN people, were they really HIS people. Did we forget in America a certain war where Lincoln was killing his own people and over 650,000 people( “confederate rebels”) died . Did Lincoln step down? Did anyone get involved? Are CNN, FOX, BBC, AL Jazeera, etc, giving us the truth? Is there a long standing vendetta against Qaddafi? Is he really a terrorist? In 1970’s when he justifiably kicked out all the European Colonialists in Libya..is that when he became a terrorist? DId he really bomb the Berlin Club? Did Reagan kill his daughter? Is that justification for allegedly bombing Pan Am? (thats if he did!) I am trying to not be so quick to judge. Libya has a problem. How many times has America asked Palestinians and Israelis to TALK it over. No one wants to talk Qaddafi and Rebels to talk?? It looks like hypocrisy and aggression. However I look forward to seeing the larger picture. Look no further than the bilderberg group. That’s like saying “Just pray to Jesus and you will get to eat today.” By saying either you imply that 1)You know anything, 2) you know the future, 3)you have evidence of your claim,, and 4) The Bilderberg Group is the only problem. Start reading man, you have a long way to go. Thanks so much for the info Dr.A. True Ott ! This Is An eye opener… i remember the story of the space shuttle seeing the water from space on a mission. This puts things in perspective. about the role the west has played globally and the true use for military might. This is what the MEDIA didn’t want you yo NO. Water, Water, Water – Libya�s Hidden Asset � The Story Behind The Story? I really want to read through even alot more concerning it. Glad you found it. Thanks for your kind words. – Libya�s Hidden Asset | The Story Behind The Story. only me or do a few of these comments look like coming from brain dead visitors? 😛 And, if you are posting at other social sites, I’d like to follow everything new you have to post. Could you make a list the complete urls of your shared pages like your Facebook page, twitter feed, or linkedin profile? Just click on the RSS feed on the front page. I’ve read some excellent stuff here. Certainly price bookmarking for revisiting. I surprise how much attempt you place to make this kind of wonderful informative website. I do not even know how I finished up here, but I thought this post was once great. I don’t recognize who you might be but definitely you are going to a well-known blogger in the event you are not already. I missed this way back then, but great article. AND even to today we hear nothing of all of that WATER! The issue concerning OUR water needs to be addressed and NEVER ignored. there are two very important things that effect us all, FOOD and WATER! I wish I new how to bring the water issue to the forefront in America today! I wrote the only article that I know of, that address’s the latest threat to the American people, (mainly in the rural areas) And that is the FARCE that is being sold as necessary for our OIL/GAS SECURITY, and that is, FRACKING! Make no mistake, ALL that I have presented on the “FRACKING” issue, are the FACTS and Fracturing for OIL is an attempt to put in place, the infrastructure to poison OUR water supply in rural America because as in the book “Brave New World” the EDOMITE “ELITE”, do not want us to have the ability to live, and be self reliant, JUST ask Col. Qaddafi of Libya, OH! that’s right, he was murdered for wanting to be left alone and NOT beholden to the EDOMITE bankers! Brother True, I would like to see you aide me in my efforts to EXPOSE the undeniable FACTS, that “FRACKING” is another diabolical attack on “WE” the GOYIM! EDOM has always used any, and every bit of technological advancements against us! This is so very important! IF this is not exposed, and SOON, it will be just as I say, ANOTHER tool to further EDOM’S agenda! GIVE what I presented a bit more thought please! You said you had passed this link on to some of your friend, but I did not hear from them, and the Fracking fact is, the FRACKING EDOMITES are marching on with this diabolical plot across the Nation! My friend in AUSTRALIA says they do not engage in Fracking there, and I have not found where Fracking is being done in the Oil Fields of the Middle East, or else where! Thank you for your careful consideration! The content of this link is mine. SHE did a fine presentation of my post. be subscribing to your feeds and even I fulfillment you access constantly quickly. « Liberty Coins? It’s Either Liberty or Loss of Freedom.